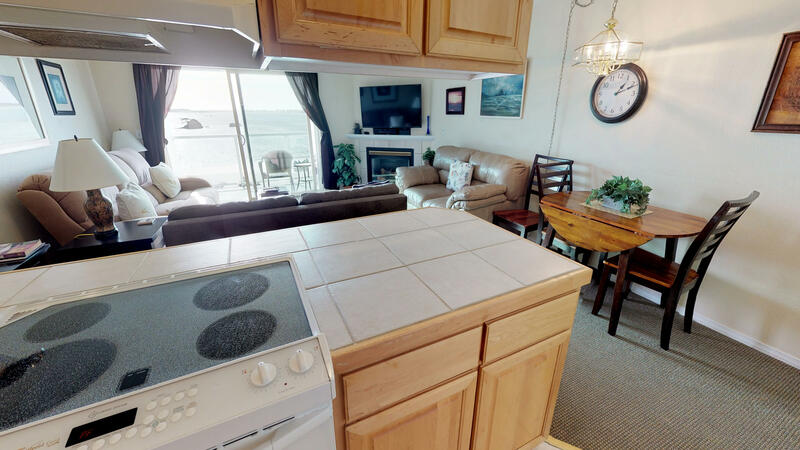 Waters Edge #308 is a two bedroom, one and a quarter bath condo with room for six guests. 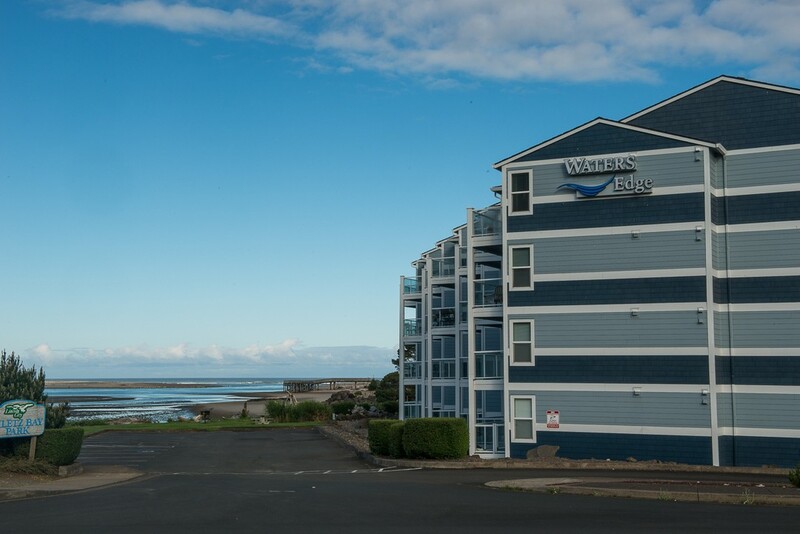 Located in the historic Taft District of Lincoln City, this third floor condo sits right on the water facing Siletz Bay with a view of the Pacific Ocean and Schooner Creek. Enjoy the eagles soaring about and the seals sunning themselves on the rocks. You'll experience tranquility at the beach while you relax and recoup at this beautiful vacation condo. 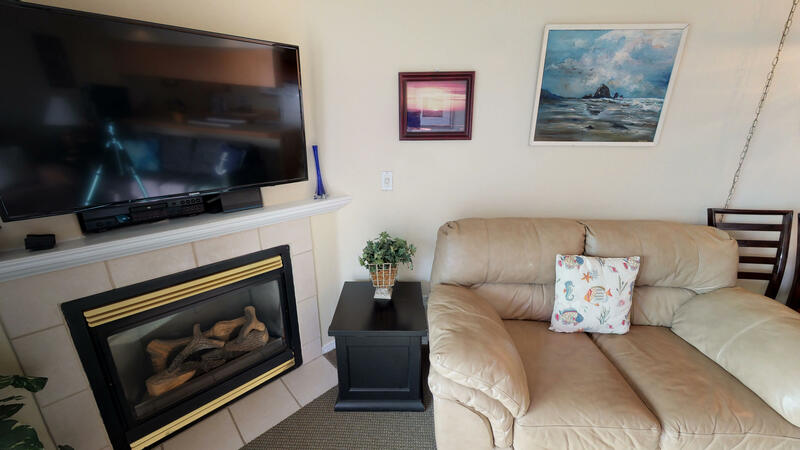 A king, a queen and an American Leather hide-a-bed are offered at this condo, along with a full kitchen with a hot water dispenser, a washer and dryer, a gas fireplace, a 50" Smart TV, and Wi-Fi. Waters Edge Condominiums has an elevator for ease of access to this third floor unit. Come down to Lincoln City with your group of six today, and experience the Oregon coast in luxury! Parking is available for up to two vehicles at this home. Please note that boats, trailers, and RVs are unfortunately not permitted. This home allows you to bring up to two dogs while vacationing here. Please do not leave dogs unattended at any time in or on the property. Please note the following: This unit will allow two dogs under 40 lbs. Larger animals will be required to be removed. Pets must be registered with Oregon Beach Vacations prior to your stay; Breed, Description, Weight, State License number for the dogs and city or county where license was purchased. "It was a well kept unit with awesome view and very homey feel." "Hello Michelle, Thank you for your review. We are happy to hear that you enjoyed your stay at Waters Edge 308. We hope to have you stay with us again soon!" "My family and I were so pleased with Waters Edge. The location was such a convenient location for the activities we are most interested in when visiting Oregon (spending time on the beach & exploring the town on foot) and was very easy to find. The space was excellent, very clean and comfortable. I stress the comfortable part as I generally don't sleep well away from home but was very well rested here. The best part about this was that my 2 sons, my husband and I all had enough space to relax when we weren't out and about. I would definitely stay here again." "Anita, thank you for taking time to send in your review. We are pleased to hear that you enjoyed the Waters Edge complex you chose to visit. You hit it right on the nail - the location is wonderful for beach combing and visiting the small area, Taft, with cute shops and great food. As well we are happy to hear the unit was clean and comfortable for you & your family members. We hope you made memories that can be shared for years to come. Once again, Anita thank you and we would enjoy hearing from you to assist in planning your next coastal getaway." "This unit is so comfortable for me, my husband and my shitzu puppy. There three of us were all satisfied to what we paid. Super clean condo, everything that we need are there waiting for us, kitchen appliances, utensils, etc., bedrooms are really neat and clean, bathroom is super clean and smells good. and the best of all, the unit is just infront of the Siletz bay. I can say I want to stay in this unit again if we come back to Oregon Coast... I can recommend this to all of my friends. THE BEST!!!... I LOVE IT... "
"This unit has it all to make your stay perfectly comfortable. The beds, furniture, everything was wonderful. Would definitely stay in this unit again!" "Hello Roger, Thank you for your review. We are glad to see that you had a great stay at Waters Edge 308. We hope your experience means that you'll be staying with us again soon!" "Hello Sharon, Thank you for your review. We are glad to know that you had a wonderful Father's Day getaway at Waters Edge 308! We hope to have you stay with us again soon!" "We very much enjoyed our stay. The view was super. The unit was very comfortable, clean and well-stocked with equipment for cooking. " "Hello Pam, Thank you for taking time to send in your review of your recent visit to WE # 308. We like to knowi our guest enjoy the property they have chosen to visit and they feel right at home when doing so. We hope you made memories that you will be able to share with family & friends. We would like to hear back from you to assist in the planning of your next coastal visit. Happy Holidays ~ Oregon Beach Vacations "
"The order in which we loved the most to least: instant hot water, all kitchen things that we could think of, good removable shower head and water pressure, GREAT view, comfortable sitting for 7 in living room, new beds, more than enough blankets-they are everywhere (in living room coffee table, in dresser draws, in closets). a block from Moe's, a great little bar on Hwy 101 just around the corner, Cinema just up 101 about 3/4 mi, (we saw Beauty & the Beast). Didn't find anything we didn't like." "My son and I stayed here for 11 days recently. We vacation here every year and have rented many different places in the past. This trip was awesome all the way around. Weather was awesome, this condo was awesome and fishing was good. The unit was clean, comfortable and renting was easy. We would definitely rent here again. Thanks for a great stay"
"Hello Andrew, Thank you for your review. We are glad to hear that you and your son had a great stay at Waters Edge 308! We hope to continue seeing the two of you in the future! Thanks again!" "We stayed in this condo for 6 days. Excellent view of the bay and sunsets! Clammers and families on the beach area below our balcony. condo exactly as described in the ads. We will return!" "Hello Kathi, Thank you for your review. We are glad to hear that you had a great time staying at Waters Edge 308. We are happy that you enjoyed the view and that the unit was exactly as described. We look forward to hosting you again soon!" "This is our third year to do this coast vacation with my mom. We love staying here as we love the beach. Evening walks on the beach are the best. Short walk to great food. People watching from the balcony is always fun. Hopefully my mom will be around next year for another trip. " "Cathy, thank you for taking time to send in your review. We enjoy hearing from our guest knowing they enjoyed their visit to the coast. 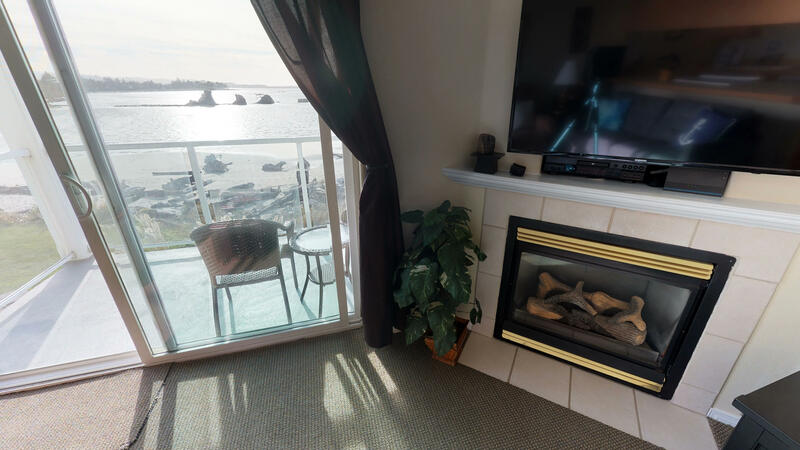 You are so right about the location of the Waters Edge Complex, so very close to beach access, food and the view from the balconies can't be beach. We hope you made memories to last forever and can share them with friends and family alike. We hope you and your Mother are able to make another trip and we would enjoy assisting in the planning of the visit for you. Again, Cathy thank you and your Mother for booking with Oregon Beach Vacations~"
"Very nice... I would back." "Hello Wendy, Thank you for your review. 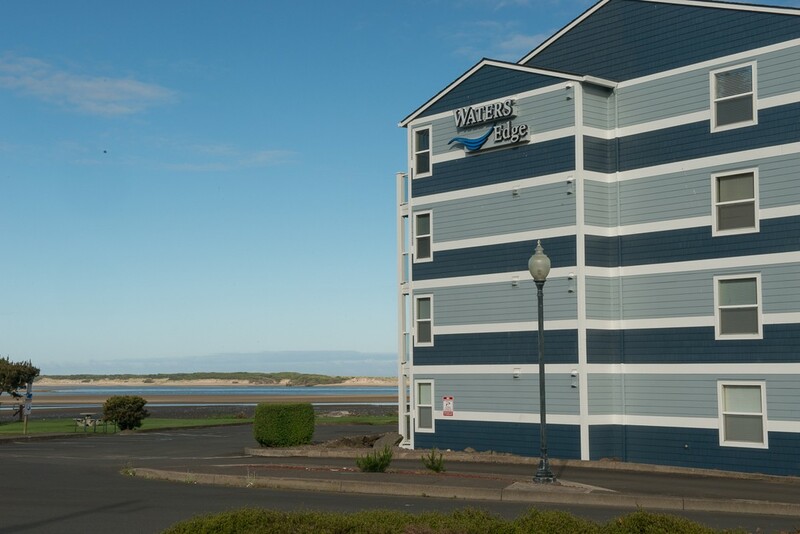 We are glad to hear that you had a great stay at Waters Edge 308, and we look forward to seeing you back again soon on the Oregon coast!" "Wonderful hope to do it again soon"
"Hello Beverly, Thank you for your review. We are happy to hear that you enjoyed your stay at Waters Edge 308! We hope to have you back again soon as well!" "Wonderful place. All amenities provided. Perfect location close to beach and great access to everything. " "Hello Debbie, Thank you for your review. We are glad to see that you had a great time at Waters Edge 308! We hope this means you'll be back again soon for another wonderful getaway!" "Very nice. Making the reservation was a little slow and didn't get a conformation by email. A day before we were to leave I called and got a different person who was very efficient and sent the information immediately. We enjoyed our stay." "Hello Sally, Thank you for your review. We are glad to hear that you enjoyed your stay at Waters Edge 308. We are sorry to hear that you did not get your confirmation email in a timely manner. These are done by our staff, and when it gets closer to the busy season, they have more to send out. We are sorry for the inconvenience. We hope to have you stay with us again soon on the Oregon coast. Thank you again for your review." "We had a great time ! It's always a pleasant stay at the Waters Edge ... Only one issue I have, we were lead to believe that there was an additional toilet & we had two sinks instead .. that was the whole reason I rented that room, due to 4 people being in the unit. Please consider being very specific on these units & list that the 1.3 bathroom is simply an additional sink. Our friends stayed in 207 , had the exact same layout as ours & I paid much more . Thank You, Kathy Parsons"
"Hello Kathy, Thank you for your review. We are glad to hear that you enjoyed your stay at Waters Edge 308. We are sorry for the confusion about the layout of this condo. We will look into this and resolve the issue so that future guests are not confused either about the number of bathrooms. Thank you for bringing this to our attention, and we hope to have you stay with us again soon on the Oregon coast." "We had a wonderful vacation in Oregon at the condo at the beach! We have been coming to this complex for several years and this condo did not disappoint. Every thing was provided , clean and beautiful. We will be back." "Hello Dean, Thank you for your review. We are glad to hear that you enjoyed your time at Waters Edge 308. We are looking forward to seeing you back for many years to come!" "W have stayed there 2 times now & have always enjoyed the excellent view. it is also kept very clean. the only thing missing was enough TP." "Hello Donna, Thank you for your review. We are glad to hear that you enjoyed another trip to Waters Edge 308. We are sorry to hear that you did not have enough TP for your stay. We provide all of our homes with 2 full rolls per bathroom. We recommend that our guests bring extra supplies or be prepared to buy more during their trip if need be. We list what is included in our stater packs on our check out page. We hope to have you back for a third visit. Thank you again for your review." "Hello B A, Thank you for your review. We are happy to hear that you enjoyed your stay at Waters Edge 308! It was most likely a welcome treat from all the summer heat in Portland! We hope to have you stay with us again soon!" "had to book on short notice because homeaway cancelled my reservation the day before i was supposed to arrive.they were great got me in and all my information in just a couple hours.the room was clean and great view"
"Hello Allen, Thank you for your review. We are glad to hear that you had a great stay at Waters Edge 308. We are sorry to hear about the hassle with having to rebook your stay, but we are glad to know that our staff was able to do it quickly for you so that you could go on your trip. We hope to have you stay with us again soon on the Oregon coast!" "Nice, nice place but you need a technician to operate the televisions. " "Hello Susan, Thank you for your review. We are glad to see that you had a great stay at Waters Edge 308. We hope to have you stay with us again soon!" 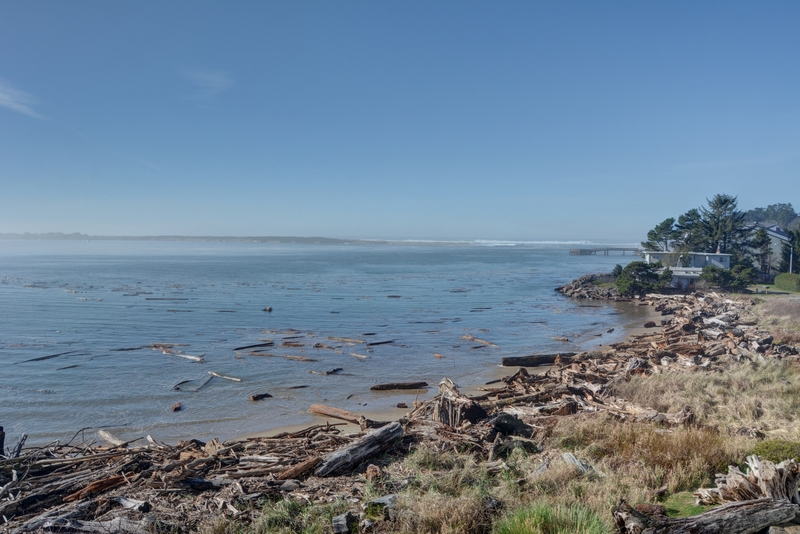 "The location, on Siletz Bay, was great! We loved the view and easy access to the sand. There are several eating options within easy walking distance. An added plus was the local IGA grocery store, also within a short walk. Our unit was so warm that we never turned up the heat. It was fun to walk along the edge of the bay out to the ocean, picking up agates along the way. One note: bring toilet paper with you. Only two rolls were provided for six guests staying two nights - not nearly enough. " "Hello Dawn, Thank you for your review. We are glad to hear that you enjoyed your stay at Waters Edge 308. It sounds like it was a lovely visit to the beach. We are sorry about the issue with the toilet paper. We provide each of our homes with a starter pack of supplies, which means two rolls of toilet paper per bathroom for a stay. We recommend to all of our guests that they should bring extra supplies or be prepared to purchase more during their stay. We are sorry about any inconvenience this caused. We hope to have you stay with us again soon on the Oregon coast. Thank you again for your review!" "We arrived on Friday and left on Sunday. The condo was very nice and provided plenty of seating for my group of 6. We stayed on the third floor, so had great views of the bay, however the weather was not up to par. Checking in and out was very easy, and I enjoyed Not having to go to the front desk and check in. Beds were comfortable which is difficult to find these days with hotels and condos. I would Definitely recommend staying here, and will potentially be staying again. " "Hello Chalynda, Thank you for your review. We are so happy to hear that you enjoyed your stay at Waters Edge 308. We are happy that the views and beds were beautiful and comfortable! We are sorry to hear the weather wasn't as nice as you were hoping for. Unfortunately on the Oregon coast, you never really know what kind of weather you'll have, especially during the winter. We'd love to see you back again during the summer when it's less rainy and more sunny! Thank you again for your review." We were in Lincoln City for our daughter's wedding. "The location of our room was great,less than 20'and the location also was next to our room on the main floor. Our children's grandmother stayed with us and she loved sitting on the deck. The bed was very comfortable. Like my 'Mom' my husband & I loved sitting on our deck. The beach was great. Our puppies, who are being trained as service dogs, also enjoyed, not only the deck, but the beach also. Yes, I would recommend this place. It is beautiful here. " "Hello Kathleen, Thank you for your review. We are so glad to hear that you had a great stay at Waters Edge 308! It sounds like your entire family was able to enjoy both the beach and unit! 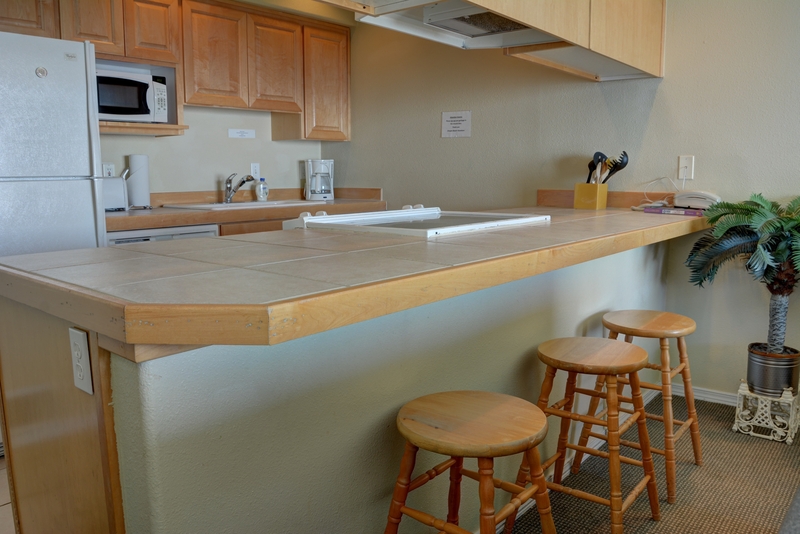 We hope to have you all stay with us again soon on the Oregon coast for another fun getaway!"